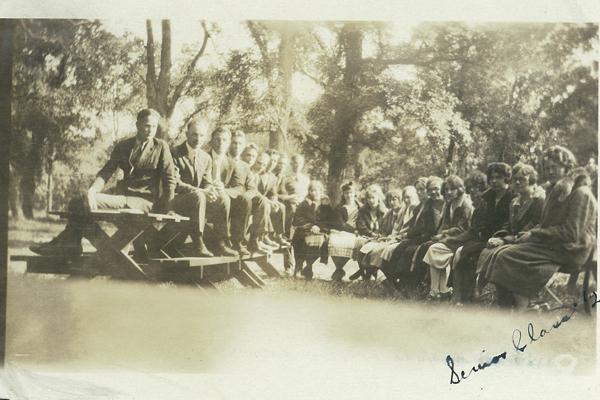 The class of 1926 had a picnic to celebrate their senior year. Gathered on picnic tables they reminisced on their year, a year that changed their lives. This now tight-knit group of kids sat on picnic tables posing for a picture we view nearly 100 years later because God used a man to cast a vision for Hillcrest that held eternal significance. Hillcrest exists to love students and drive them to a fortified faith. At the opening of one of HIllcrest's first school years, President E.M. Broen welcomed students with a charge from Zechariah 4:1-10. Broen spoke to how the nation of Israel despised two simple olive trees. Through the passage the Lord explains that these olive trees will be used to serve the entire earth. The call from the Lord was not to despise the roots of the nation's humble beginnings. Broen took this picture to point to the Bible school that would later birth Hillcrest Academy. Broen urged those in attendance that they should not “despise the day of small beginnings.” He was confident God would use the Bible School to work in mighty ways in youth. This care and concern transferred to teachers welcoming students to Hillcrest for the first time. Mirroring the welcome Broen gave students at the school’s opening, a student’s reception was an ongoing practice through the 1930s, 40s and 50s. Students in 1941 remarked that their reception hosted a life-size silhoutte of Jesus, with doves fluttering around Him and the words “Peace” on a placard that welcomed students. Today Hillcrest students are greeted with a welcome week. During this time athletic practices occur in the mornings, with evenings hosting services welcoming students. Faculty, staff, and friends of Hillcrest help welcome the students through song, testimony, and sharing spiritual insight that mirrors the days of E.M. Broen, calling students to not despise the days of small beginnings. In the same way the class of 1926 walked through open doors at Hillcrest Academy to receive humble training in God's word and world, today students will enter a place of simple beginnings that exists to serve the world to communicate the Gospel of Jesus Christ.